Cinema | Brush With Greatness: My Kid Could Paint That turns a quest for storytelling truth into high art. Your documentary, on some level, is going to be a lie,” says New York Times art critic Michael Kimmelman near the end of the mesmerizing documentary My Kid Could Paint That. “I’ll say that right now if you’d like,” he offers before turning away from the camera for a moment, taking a breath and preparing himself for a second, more formal take: “Your documentary, on some level, will be a lie,” Kimmelman repeats. It’s a small, throwaway moment that director Amir Bar-Lev includes, and it would be tempting out of context to suggest that Bar-Lev left in the first iteration of the comment simply as a gag at Kimmelman’s expense. But he’s on to something so much bigger than the film’s ostensible subject that it flows naturally and perfectly from all that has preceded it. 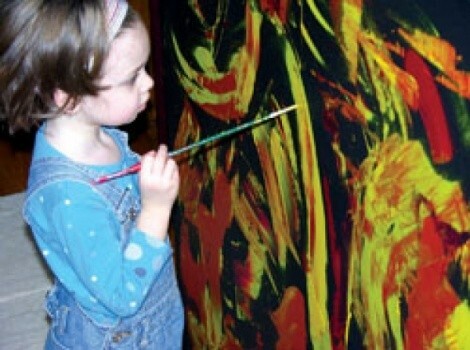 Yes, My Kid Could Paint That is about a 4-year-old girl named Marla Olmstead who became celebrated for her abstract paintings. And it’s about the challenge of how to judge splotches of color on a canvas. But it’s ultimately about one of the biggest questions any documentary has ever tackled: how we as human beings make sense of the world. Bar-Lev’s year of access takes him through plot turns that no one could possibly anticipate from the outset. Marla’s story—how she had begun painting abstract art while in her diapers, and how her work had caught the eye of collectors—already had carried beyond her upstate New York home into the national and international consciousness when Bar-Lev entered the Olmsteads’ lives in 2004. But a February 2005 60 Minutes II profile calls into question whether Marla really painted the works attributed to her—and the eye of suspicion falls on her amateur-artist dad Mark, who is heard coaching her off-screen during the broadcast. There’s an element of mystery to the way the narrative of My Kid Could Paint That unfolds, and some viewers are bound to draw their own conclusions regarding whether or not Marla really is a wunderkind. In a sense, however, that question is a feint. The authorship of Marla’s work may matter to those who collect it, and even to Bar-Lev himself, but it doesn’t matter ultimately to the success or failure of the film. That is not, on a fundamental level, the film’s story. The film’s story is, as it turns out, the entire concept of “story” itself. Bar-Lev uses the Marla controversy as an entry point into the way her art’s value becomes inextricably tied to the identity of the artist as a pre-schooler. Experts argue that the work with her name on it could find a place in the Museum of Modern Art; does that quality vanish if the artist is, in fact, a 30-something-year-old man? Or is this a recognition of the way worth comes from the story behind a thing as much as the thing itself, in the same way that the $5 baseball launched by Barry Bonds into major league home-run history becomes worth $1 million as soon as it lands? Bar-Lev explores this idea not primarily through talking-head commentary, though the speakers—including Kimmelman and Binghamton, N.Y. newspaper columnist Elizabeth Cohen, who broke the Marla story— often are sharp and insightful. He finds scenes that are simultaneously comic and depressing, as when Marla’s gallery representative Anthony Brunelli talks a skeptical collector into buying a painting, the creation of which has been documented on DVD as an attempt to reassure skeptics. The collector ultimately agrees to make the purchase, but she expresses little joy in her new acquisition. She has been persuaded to buy not the art that she likes, but the one with a story that could make it a better investment. Perhaps one of the most intriguing angles is one raised by Marla’s mother Laura early in the film—essentially, the degree to which “chaos theory” is winding its way into Bar-Lev’s film. If the act of observing something changes it fundamentally, how can we know who painted “Marla’s” paintings? Bar-Lev confesses on camera his discomfort at becoming emotionally involved in his story, and Brunelli chides him for “not letting the story be what it is.” But My Kid Could Paint That ultimately exonerates Bar-Lev by demonstrating how it couldn’t possibly be otherwise. Whether or not Marla Olmstead is a child prodigy, she’s yet another example of how the storyteller can’t help becoming part of the story.